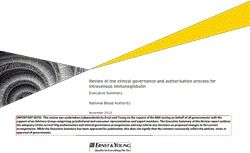 The National Blood Authority (NBA), on behalf of all Australian governments, commissioned a review of the adequacy of the existing intravenous immunoglobulin (IVIg) authorisation and clinical governance arrangements, with a view to recommending options for improvements to deliver governments’ goals for the management of IVIg. The review also analysed the issues, benefits and risks of potentially including normal human immunoglobulin (NHIg) and subcutaneous immunoglobulin (SCIg) in the IVIg management framework. The review highlighted significant variation in IVIg use, management and processes nationally, with a number of inefficiencies being described. Improvements recommended by Ernst and Young in review included short term and long terms improvement projects. 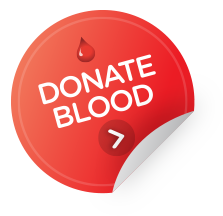 Define and deliver a package of information concerning current IVIg products and arrangements, particularly for junior medical and nursing staff. The longer term strategic projects recommended by Ernst and Young included projects to establish the knowledge base and decision making processes to allow further improvement, and strategic projects targeted at transitioning arrangements to a more self‐supporting and continuously improving mode. Further work is continuing to consider these recommendations within the proposed centralised model and provide more detailed advice to governments. Any proposed structural changes to the current IVIg arrangements would require governments’ endorsement.